The ever-memorable Abbess, Gerontissa Macrina (1921-1995). 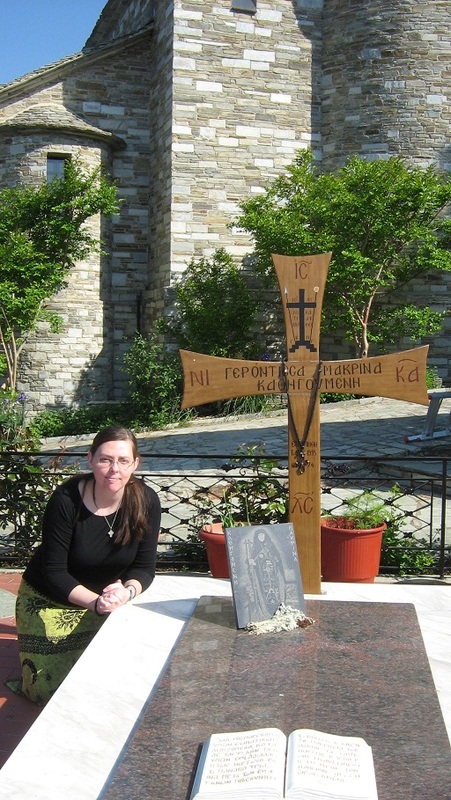 This past Thursday, May 3, I had the blessing of visiting two beautiful monasteries in the Volos area with the sisters – our chanting instructors – from a monastery here in Thessaloniki and my Byzantine chant classmates. I’m in my second year of a three-year course in Byzantine chant thanks to the great love and generosity of the sisters who take their time and talent to offer us lessons for two hours once a week. One of the monasteries we visited was Panagia Odigitria (All-Holy Directress) Monastery in Portaria, near the top of a mountain overlooking Volos. This monastery is very close to my heart for many reasons, not least of which is because the ever-memorable Abbess Macrina founded it with five or six other young ladies (who also longed to live for their Bridegroom Christ) through the prayers and blessing of the monastery’s original spiritual father Elder Joseph the Hesychast (whose inspired words won my heart over to Holy Orthodoxy when I read his book Monastic Wisdom). 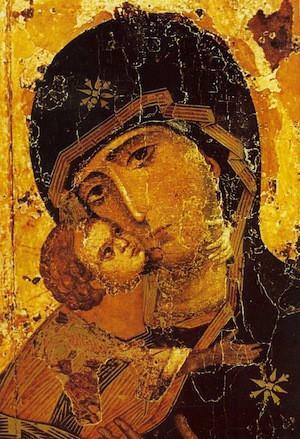 Gerontissa Macrina is a spiritual giant of our time, the likes of which we saw in the early, holy ascetic Mothers. I don’t think any material exists on her in the English language – an unfortunate reality I hope will soon be remedied. 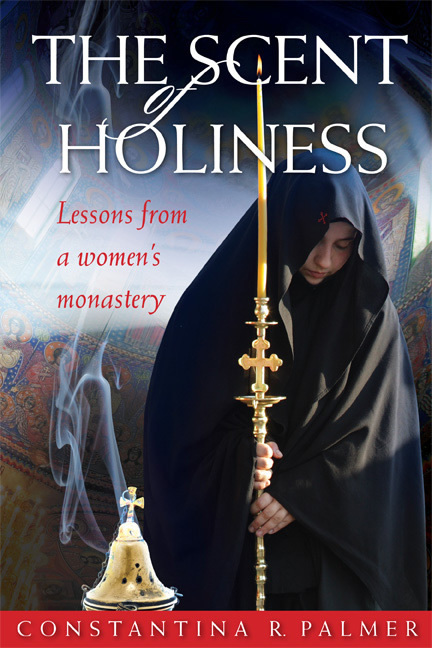 (I write a bit about her in my book The Scent of Holiness, but the small section I have on her does not do justice to her great work and person). A volume is being prepared about her life and work in Greek which, God willing, will be available soon and translated into English not long after that. The monastery in Portaria shone [because of] its spirituality. And thousands of faithful, not only from the [surrounding] area, but also from all over Greece, found a harbour close to the unforgettable Gerontissa Macrina, and they received spiritual benefit. Her face radiated goodness, love, sincerity, and faith. Her peace and her sweet words were a staff and a fountain of strength for all those who were blessed to know her. At the ever-memorable Gerontissa Macrina’s grave. Panagia Odigitria Monastery, Portaria, Volos, Greece, 2012. May we have her blessing! Thank you very much for this post! 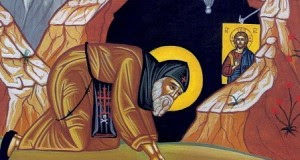 Gerontissa Macrina was the gerontissa of the present Gerontissa Olympiada at Holy Protection Monastery in Pennsylvania. It has been such a blessing to be a (if I can be so bold) spiritual daughter of the spiritual daughter of such a holy person. I do wish that there was something available about her in English. 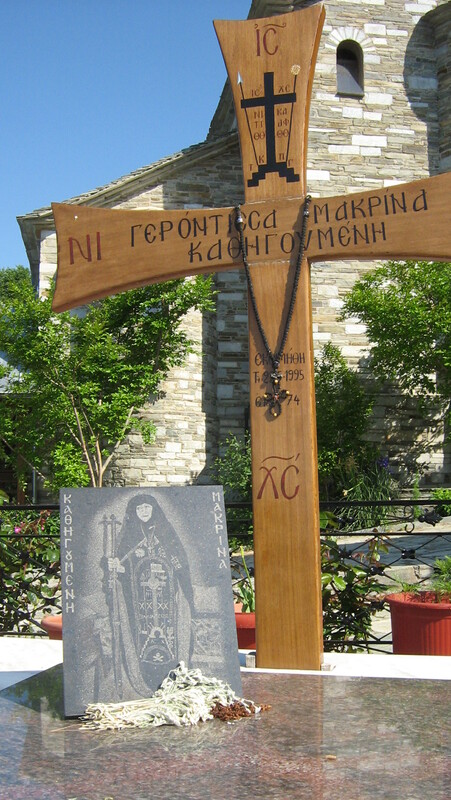 Gerontissa Macrina was the spiritual mother of many of the abbesses of the Greek monasteries in North America. God willing, I’ll translate more material on her and post it here. It sounds like you enjoyed your recent trip up to the monastery in Pennsylvania. I hope you brought lots of blessings “back into the world” with you.